Southern refugia and range shifts of thermophilic species are detectable for many butterfly species. Pleistocene climatic oscillation caused severe range changes of species, which often survived in southern refugia around the Mediterranean. These range changes were reconstructed by genetic analyses. The genetic imprints of the past like distinct genetic lineages in Central Europe, as analysed for Melanargia galathea and Maniola jurtina, give evidence for isolated refugia and postglacial recolonisation pathways. Furthermore, Sea Straits are often barriers and cause restricted gene-flow. Genetic analyses on four butterfly species showed no genetic differentiation despite a more than 140km sea-barrier; the reason is the much lower sea-level of the Mediterranean Sea (during the Salinity Crisis), which caused a merging of the two landmasses of Italy and North Africa. (Markers: allozymes, morphometry, funded by the Musée national d´histoire naturelle Luxembourg). Read more: Habel JC, Husemann M, Rödder D, Schmitt T (2011) Is the Atlanto-Mediterranean refuge real? Speciation hotspot and expansion dynamics of Melanargia ines in Western Mediterranean. Biological Journal of the Linnean Society 104: 828-837. 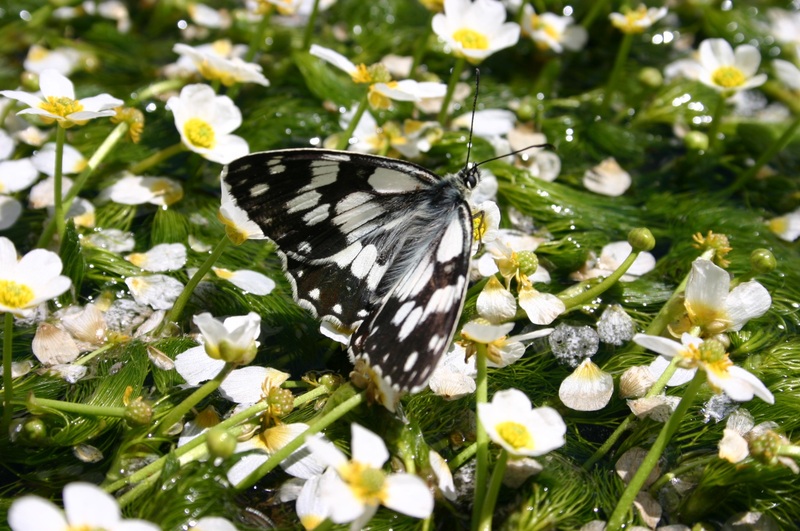 Habel JC, Lens L, Rödder D, Schmitt T (2011) From Africa to Europe and back: multiple range shifts and colonisations caused high genetic variability in the Marbled White butterfly. BMC Evolutionary Biology 11: 215. Habel JC, Rödder D, Scalercio S, Meyer M, Schmitt T (2010) Strong genetic cohesiveness between Italy and the Maghreb in four butterfly species. Biological Journal of the Linnean Society 99: 818-830. Habel JC, Dieker P, Schmitt T (2009) Biogeographical connections between the Maghreb and the Mediterraenan peninsulas of southern Europe. Biological Journal of the Linnean Society 98: 693-703. Habel JC, Meyer M, El Mousadik A, Schmitt T (2008) Africa goes Europa: The complete phylogeography of the Marbled White butterfly species complex Melanargia galathea / lachesis. Organisms, Diversity & Evolution 8: 121-129. Habel JC, Schmitt T, Müller P (2005) The fourth paradigm pattern of postglacial range expansion of European terrestrial species: the phylogeography of the Marbled White butterfly (Satyrinae, Lepidoptera). Journal of Biogeography 32: 1489-1497.